Time for another ‘Token of Appreciation’ post… I am overwhelmed Baron. So sweet of you to give me another award. 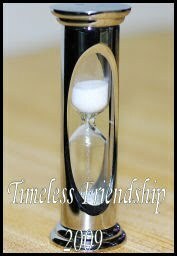 This time 'Timeless Friendship Award'. U r so sweet. Thanks a ton, dear. This award too comes with the instruction to be passed on to other newly discovered blogs. So, below is the list and its not in any particular order. 1. Venky – A cricaholic who is absolutely crazy and has ridiculous imaginations… He fights with rain, he freaks out the shopkeepers, finds funny inside meanings of regular things. 2. Mojo Arasu – The man of little things. He zooms into everything. A clock, a strand of hair, a leaf, a ball of cotton everything he puts his hand on. 3. Kcalpesh – He either clicks great pics or edits ordinary pics in an extraordinary way to make it great. 5. Aysegul – Aysegul Tastaban Erzincanoglu – Her full name, which I like a lot. Her blog is esp. about Turkey. It’s all about Turkey. 6. Brian Miller – ‘Married to the most amazing woman and dad of two adventurous boys’ – as he says himself. I love the posts he makes about his kids. They are cho chweet! 8. Diane – She had travelled the world and finally settled in Australia. She’s a lovely photographer who clicks in and around her place. Congrats to my dear fellow bloggers. Now comes your part to be done. 2. Pass the award to as many or as few other blogs that you have newly discovered. Remember to contact the bloggers to let them know they have been chosen for this award. My Mommy put it on our blog !!!! I valued it.I put it on my blog. Thank you very much for this. I'll have a look at the other blogs you've listed. Hey thanks alot for the award. I am sure you will have some hard time writing my full name :)) I will display your award on my blog..
Hello Mitr! Congrats on your award. I just wanted to say that I laugh very loud every time I go back to my blog page and try to twist my face like that tree, ha ha ha! And I think of you doing it too, I can't stop giggling! Very true. But I love unusual names. U r welcome dear. thanks for the award mitr. big smiles. I want to vote for you, but don't want to sign-up there. Please advise. Thanks dear. Oh, the only way to vote is thru signing up, dear... What to do...!!! I'd been away for some time. Hence couldnt collect the award, will take it now and do the needful :-) Thanks so much!